Article by Kevin Ryan Crime Scene Reviewer ©. 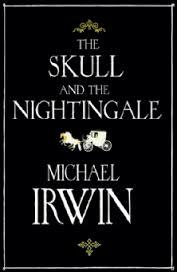 The Skull and the Nightingale has all the hallmarks of a gothic horror pastiche on first sight: a stark, black cover with a silhouette of a carriage and horses; within, the endpapers show a map of olde London, blood-red. The description on the inside cover talks of a ‘chilling and deliciously dark tale’ and ‘“experiments” into the workings of human behaviour’. I rubbed my hands at the thoughts of roaring fires, brooding houses, Ripper-type characters stalking pea-souped streets. Murder! Gore! Even a spot of cannibalism. But it was not to be. I should have recognised from the outset that the physical quality of the book and the immediate quality of the writing was not going to serve me up a second-rate penny dreadful. And so began a tale that surprised me and enthralled me. We first meet our hero, Richard Fenwick, returning from his two-year grand tour of Europe. One would think him to be a man of means, but the difference between appearance and reality is one of the themes at the core of the book. For Richard’s tour was funded by his godfather, Mr Gilbert, a friend of his late parents. It becomes plain that Richard is dependent on his godfather for his financial wellbeing and one of his main goals is to ensure that he is looked after in Gilbert’s will. Indeed, most of Richard’s motley gang of friends seem to be chasing after one sponsor or another. This detail and others provide a rich layer of authenticity to the book; the culture of London and the societal mores of the 1760s provide plenty of material for the comic and bawdy adventures of the young men and women we encounter. Several scenes are shocking in their depiction of the debauchery of the time but yet feel utterly real. Not everything is fun and games for Richard. On his travels he has realised that he loves his friend and soul-mate, Sarah, who he left behind in London. He deeply regrets not making his feelings clear for her before he departed and fears he may be returning too late. He has. Sarah has married a wealthy businessman and their reunion is bittersweet. Into this setting steps Mr Gilbert. Richard’s godfather has lived his life without passion and although he is rich, his reservoirs of emotional and pleasurable experiences are dry. Now this desiccated character wishes to have one more go at life, but to live it vicariously through Richard. He strikes a bargain with his godson: money for tales of the dark side of London, and details of Richard’s life there as a young buck. Richard obliges and writes to Gilbert of his experiences and the unusual characters he meets, none more so than the 30-stone Thomas Crocker, a man-mountain of flesh and impulse, who understands that his genes have doomed him to a short life and aims to live it fully. Soon Richard’s circuits of the London scene bring him back into contact with Sarah and neither finds it easy to dismiss the overflowing feelings they have for each other. Richard hopes that by some miracle he and Sarah can be brought together, but refuses to dishonour her feelings or reputation. However Gilbert understands his godson’s cravings: he salivates at the emotional potential of this relationship and insists that Richard bring the matter to a head and attempt to cuckold Sarah’s husband. Let the dice fall whatever way thereafter. Richard is torn between his inheritance and respecting his hopeless relationship with the woman he loves. Tragedy can be the only result. The Skull and the Nightingale is a real page-turner in an unusual setting given life by deft research and writing. Well-drawn central characters, a vivid atmosphere and a keen eye for psychology all create a fast-moving tale with a surprisingly emotional core. No cannibals then, but a really nice book that will challenge your modern-day moral compass and resonate with you well after you put it down.